Information provided and reinforced over a longer period of time is better remembered than information taught over a single period. 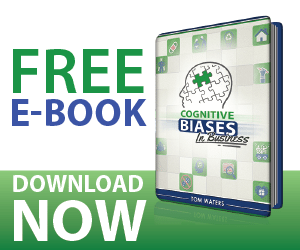 This bias applies to both sales training and complex sales with longer selling cycles. Focusing on key components over multiple intervals can help your audience better understand the core principles leading them to better decisions. The longer you stay with a prospect and elaborate on how your value-proposition benefits their day-to-day, the likelihood of your brand being recalled during a potential need for your company will increase. Immediate sales are important so it is very easy to keep after low hanging fruit and ignore the long cycle / high reward prospect in your pipeline. In sales training, we want to see measurable results as quickly as possible. In a sales cycle, we want to win the business as quickly as possible. Spacing the learning process is counter intuitive to our objectives. Always keep diligent notes and set reminder calendar events. The follow up activity could be a full year or longer depending on the prospect but if you continue to provide relevant and useful information that resonates with a prospect you will win more often than the competitor who doesn’t. Focusing on individual performance topics to help sales reps gain mastery before moving on will help fortify overall performance. Focusing on unique and relevant value improvements during the sale allows you to better understand the importance of each element for a final presentation.